While it was obviously disappointing that Dumbarton got dumped straight out of the Alba Challenge Cup by Morton (of all teams) the other day, I suppose at least the news from the second round draw means that another long trip to probable defeat against Ross County has been avoided. Mind you, Sons got a draw against them before losing a Scottish Cup replay last season. But it's a massive haul and no financial gain. In fact, we seem to have a habit of picking up particular teams in knock-out tournaments. In addition to Ross, St Mirren (and a painful 7-0 drubbing) come to mind. Now Celtic away in the Scottish Cup, from 2006. That would be worth a replay. And this time maybe some Bhoys fans might actually turn up... Meanwhile, it's the thrill of Stirling Albion in the Stirlingshire Cup next up on 4 August. A useful test, actually. Good 'Quote of the Day' courtesy of Kerron Cross: "It's 43 years since England played West Germany at Wembley...don't tell me who wins, I've recorded it." (DJ and radio host Nicky Campbell). Ah, shades of The Likely Lads. I am sure, given his heritage, Nicky will soon discover from the next video-tape -- or, rather, Super-8 -- that in 1967 Scotland went on to beat the winners of that game 3-2 and become undisputed World Champions. Not much has been going right for freshly-relegated Southampton of late - by definition, I suppose: though the twists and turns at St Mary's (see link at the beginning) have been extreme, even by football's well-developed standards of the bizarre. But there's always moments of glory from the past for their fans to dwell upon for inspiration, I suppose. I saw famed ex-manager Lawrie Mcmenemy on the train recently. He's still looking chipper, I'm glad to report. Meanwhile, my friend Mary Houston (who has the same kind of interest in the Beautiful Game as I have in... well, things I don't like) is about to move into a block of flats named in honour of Saints' attacking legend turned-race-horse-mogul Mick Channon. The Dell, Southampton. There's an address to remind you of Pompey and circumstance. Kind of. I wonder if her kitchen has a mullet on the wall? ... and the Sons finally did. After five pre-season defeats and one Alba Cup loss (that's six in a row without a win), Dumbarton at last pulled off a result, 5-4 on penalties, after going two behind to East Stirling in the Stirlingshire Cup, and then heaving back level thanks to the 19s. I won't repeat Denise Currie's, er, 'loyal but realistic' view of some of our performance, but a win under the belt will hopefully be a bit of a morale booster as the new season in Division Two gets under way. And the contribution of the youngsters is clearly to be welcomed. It's going to be a tough season though, I imagine. Football boots not climbing boots needed, lads. Maybe both, on second thoughts. 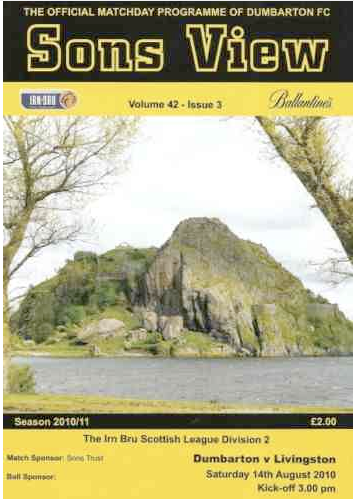 The bad news was that Dumbarton got knocked out of the mighty Alba Challenge Cup by local rivals Morton yesterday (Sunday 26 July 2009, if you are reading this from a far planet or the next century). The good news -- much more significant in terms of the season as a whole -- is that Sons have re-signed 22-year-old Hearts' striker Denis McLaughlin for a second loan spell at the Strathclyde Homes Stadium. DFC chief executive Gilbert Lawrie commented: "During the month we hope to conclude a permanent deal." Denis has already been training with us, and played for the Sons in pre-season games as a trialist. As well-sourced media rumours persist that ex-Chelsea boss Avram Grant may be lured to Hearts in a director-of-football role (if a large sum of money can be stumped up), it appears that McLaughlin does not feature in Jambo manager Csaba Laszlo's plans. David Witteveen has already arrived from Red Bull Salzburg. No one's crying at Dumbarton, mind. I went to see Exeter City take on Derby County on Saturday. The Grecians had some fine moments, and it seems that, once again, manager Paul Tisdale has made some un-flamboyant but judicious signings over the summer. That said, Derby completely outclassed them at times. The final result was 3-1 to the Rams. It could have been 5-2. That would have been a fair reflection of the balance of play overall. It was a pleasantly entertaining game, though. Plenty of good, flowing moves and touches... plus no-one really had to worry about the result and ex-City man Dean Moxey, back immediately after his transfer, got a good reception and a presentation from the youngsters at the end of the match. He had a constructive game, though his through-balls from the back were often rather predictable. Robbie Savage was shouting at him (and other Derbyites) as soon as he got onto the field towards the end of the second half. Meanwhile, it was "interesting" to be charged £15 for a friendly game and to discover that the main stand prices (where I sit) will be up this season from £16 to £20 - or more. £25 for the Leeds United game. The commercial vibe is noticeably increasing, in fact. Tony Pryce Sports are taking over the club shop (wonder if prices will go up and merchandise become more 'formatted'?). At this match food and programme sellers were roaming the stands during the game, as they do in US baseball. "Programme!" one guy was shouting, as he half-blocked my view of the action. I was tempted to reply, "No, unobstructed view of the pitch, please!" City fans will understand that financial pressures increase as you go up the League pyramid. The old stand has to be replaced, too, and that will not be cheap. But there is also a law of diminishing returns. I think £19 would have been a smarter move than £20. It's less of a price Rubicon. I confess that, as a non-season ticket holder, but a regular, I may now sometimes think twice about going to a home game every time I'm in Exeter. (I also have to keep an eye on the pounds to fund my trips to Dumbarton.) And I suspect non-regulars will be put off. The calculation, I assume, is that this does not matter, because there will be more "it's League One, so now we'll go" characters paying up. Plus season ticket sales are over 2,000 already, I'm told. The Trust and ECFC officials might like to think about this, however. If I want a corporate experience, I'll pay for it elsewhere. It's not what I want at Exeter. What next, stopping me from taking my tea flask in? Try that one, and they'll lose me for good. Meanwhile, some old traditions continue. Like Mike Blackstone's superb matchday programme, The Grecian, which I'm honoured to be writing for again this term. Plenty of local colour in that, alongside the professionalism. The two can and should go together. This season it’s exactly forty years since I started supporting the Sons. I was nearly 12-years-old when I made the momentous decision to ditch Manchester United, and I’ve never looked back (or anywhere else, other than showing an interest in whatever my local team happens to be). As the title of this column indicates, I’ve been a ‘far post’ fan all my life – since, until a few years ago, I had no close relations to Dumbarton. My football loyalty was decided by a confusion in my young mind about where Ayrshire was – since that is where my great grandparents on my mother’s side had some actual family links. That and a bit of a penchant for what my late parents termed ‘exotic underdogs’. Well, hey, at least that makes DFC exotic, even if the comment wasn’t meant in an entirely sympathetic way! The reason I mention all this again (apart from the fact that I get asked it from time-to-time) is that this season, and especially this game, is a time of remembering. And for me, as for many others, it marks the end of one season and the beginning of another in which the highs of Championship winning celebration and the lows of shock and sadness at the terrible loss of Gordon Lennon are inseparably connected. I have always been proud to be a Sons fan, but never so much as in recent weeks. Nothing can ever take away the tragedy of Guido’s death. The loss this represents to Kelly, Kai, his family and many friends is incalculable. But the extraordinary response from Dumbarton as a Club, a group of supporters and a community has been incredibly moving to behold – and perhaps I notice it in a rather different way to many of you, because I live hundreds of miles away. That fact alters your view in all kinds of ways. I was conscious when talking to friends in the town in the immediate aftermath of Gordon’s accident just how cut off you feel when you are physically distant: protected in a certain way from the full force of the emotion at a time like this, but also very aware of what people are going through and how they are responding. It is the reaction of everyone involved, young and old, close and far, which has shown what a truly great Club this is. The stories of kindnesses small and large will stay with us and sustain us for many years, along with the poignant images of Guido holding aloft the Third Division Champions Trophy at Annan, and all the celebrations in and around the town. The Sons TV interview, too, strikes deep. I felt very honoured to share in all this in a small way by coming up for the friendlies against Partick Thistle and St Mirren earlier this month, and shaking a bucket for the Gordon Lennon Fund – into which Denise Currie, Robert Ryan and many, many others are putting a great deal of love and work. When I was a kid my father, who had a strongly charitable heart, used to dragoon me into street collections for all sorts of causes he was involved with. So I suppose I have some experience of shaking a tin, though not always quite as willingly as this! What struck me was that this time people didn’t need asking – they almost fell over one another to contribute. That goes for away fans, too. I collected at the Buddies end on 16 July, and like the Jags supporters and all at Annan, they did real credit to their Clubs by their generosity. In the face of the wounding and inexplicable death of one so young, with so much still to give, this is some comfort. None of us need telling that the world can be a cruel and heartless place. 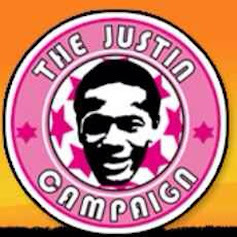 But because it’s easy to be cynical, perhaps we do need reminding that human beings can really pull together, that good can come out of tragedy, and that there are more important things in life than football. Today is that reminder. It’s also another game against a longstanding rival, Morton. 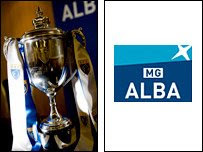 Given everything that’s happened over the summer, many Sons fans may need some convincing that the Alba Challenge Cup matters. Guido wouldn’t have needed any convincing. His passion for the game, for life and for his loved ones is what we celebrate this afternoon and seek to honour in the 2009-10 season. Let’s hope it’s a good game. Whatever happens on the park, it cannot but be a really significant occasion for all of us. I confess that, what with a busy summer, a trip to the US and the focus on Dumbarton, I haven't really been following developments for my locals, Exeter City, that closely. Today I will have the opportunity to check out their signings and prospects at home against Championship hopefuls Derby County. The friendly will elicit mixed feelings from the faithful at St James' Park. On the one hand, there are aspirations to make the next step up to where the Rams currently reside. We will soon see what the gap between League Two and League One looks like - and the rung above that will be on show this afternoon. One of the beauties of the internet, as distinct from the harsh reality of print journalism (where I was reared many moons ago), is that you can re-write your mistakes rather easily. Erasing, for example, the fact that you - OK, I - may have recently penned a couple of posts and a programme note alleging that Partick Thistle beat the mighty Dumbarton 3-0. They did no such thing. It was two only, and that was a flattering judgement on the men in pink and grey, as ex-Jag Stevie Murray ran rings round them in the first half. I know, I know Kenny.... that's only part of the story. But the Sons have given away enough goals in our pre-season without me adding to the tally! Talking of Stevie (pictured, celebrating yet another goal), I had a brief word with him in the SHS community suite after the St Mirren game. Nice guy, and clearly enjoying his time with the Sons. The cries of "Come back, Stevie" from the Thistle faithful are going to fall on deaf ears, though he clearly and rightly has plenty of respect for his former employers. Anyway, he was looking forward (somewhat ruefully) to the Middlesbrough challenge. And his assessment was right! Because I was helping get out a small Dumbarton programme sheet for the Middlesbrough friendly on 22 July, I ended up dealing with the 'Boro media people at the Club for squad news and so forth. And deeply impressed I was by their concern to show real respect for Gordon Lennon. They ran a story on their website explaining what had happened, why the 'Boro players would be wearing black arm bands, and that manager Gareth Southgate would be presenting a bouquet of flowers to the popular right-back's fiancée, Kelly, and six-month-old son, Kai, before the game. 'Boro fans also contributed generously to the donations of nearly £1000 that came in the memorial fund bucket collection – adding to several thousand already raised, with the more to come at the Morton Alba Challenge Cup game on Saturday. Heartening stuff. I was sad I couldn’t be there, but happy to be able to help with the programme and liaison with 'Boro over their use of Donald Fullarton’s splendid Guido pictures and one or two other matters. There's another one here, showing Southgate with the Lennon family group. I had a text late last night from my friend Jonathan Crawford (a West Ham fan). He’d just seen a brief clip of Dumbarton on Sky Sports News and wondered why you could see houses and scenery rather than a stand at one of the goal ends. I explained the reality of lower league life in Scotland. The Strathclyde Homes Stadium, splendid as it is (and both Scotland and European teams like training there), has just one stand, seating a little over 2,000. Mind you, there are splendid views to be had of the river when the action palls on the good quality pitch. Not to mention the glories of Dumbarton castle on ‘the Rock’ immediately behind us. SHS must be one of the most picturesque football grounds in Britain, and though the Club are undoubtedly sage to explore the full range of possibilities for the future, I confess to loving the place. The sadly dilapidated old Boghead Park was drenched in memories, of course, and hard to leave back in 2000. But the new home is a splendid – and still under-utilised – resource. Back to the telly. I missed the clip of Sons versus Middlesbrough myself, but hopefully someone will get them up on YouTube. Jonathan made the comment that I’d only missed a Boro goal – one of five, as the mighty DFC were educated about the massive difference between SFL Leagues Two and Three and a newly-relegated English Premier side about to settle into the Championship… though not for too long, the faithful at the Riverside are hoping. A goal against the Sons, maybe. But I’d still like to see it. As I also remarked in my text exchange: “Humility comes easy to a Dumbarton fan. TV coverage does not!” Talking of which, its fantastic news that the new ‘Sons TV’ initiative is streaming off the Club website. Another triumph for the Sonstrust. Six minute clips, goals and summaries will be really, really welcome to those of us who can only get to a few games at SHS and on the road. The material up there now is a fine selection from the conclusion to our 2008-9 Third Division title-winning season. Of course the sight of Gordon Lennon celebrating and being interviewed is deeply poignant given his tragic death shortly afterwards, but also greatly appreciated, I’m sure. For most of the summer our minds have been on matters more important than football – namely the family and friends of our sadly missed captain, Guido. Everyone at the Club is committed to making the endeavours of the coming Second Division season a fitting tribute to Gordon Lennon, to Kelly and to Kai; and gaffer Jim Chapman and his squad (including new additions and a variety of trialists) are now hard at work. Sons fans will be a little disappointed that penalty shootouts robbed Dumbarton of a tangible reward for the players’ efforts in the Annan Tournament at the weekend. But a good time was had by all, the Galabankies were generous hosts, and DFC chief executive Gilbert Lawrie told Sons View that “the right lessons are being learned” from a tough pre-season schedule. Of course we’ve also welcomed First Division neighbours Partick Thistle and regular SPL opponents St Mirren to the Strathclyde Homes Stadium in the past ten days. And while both results went against Sons (2-0 and 3-0), there were some good individual performances, especially in the first half of both games. There are full match reports and pictures on the Club website. Tonight’s visitors may now be contemplating life in the Championship in England for 2009-10, having narrowly lost out in the relegation survival battle in the Premier League last season – but they are determined to push to the top again. While Stewart Downing has just completed a £12 million move to Aston Villa (thus missing out on the rare opportunity to visit the Rock and one of Britain’s oldest clubs! ), Boro have been attracting young talent over the summer – including Mark Yeates, who believes his move to Teesside can boost both his career and the club's fortunes. Down South managerial careers around the top flight are perilous. But Boro have stuck by well-regarded Gareth Southgate, and he is determined to help the club rise again. This training trip to Scotland is part of that process. Dumbarton are delighted Middlesbrough and their fans will be making good use of the facilities at SHS while they are here. Like the Sons, Boro have a long history. Founded in 1876, they went professional in 1889, played at Ayresome Park for 92 years before moving to the Riverside in 1995, and co-founded the Premier League in 1992. The club's highest league finish to date was third in the old First Division in 1913–14, and they have spent just two seasons outside of the Football League's top two divisions. They are tough opponents for the Sons this evening. Goodness me, is it really a month since Only Just Offside was updated? It's been a busy and challenging summer in all kinds of ways. Last week I was up in Dumbarton watching the two friendlies against Partick Thistle from Division One and St Mirren from the SPL. We lost by two and three apiece respectively, but there was some entertainment value in the midst, a few trialists were exercised, and Sons gave good account of themselves from time-to-time in the two first halves - in spite of the results. Two draws against Queen of the South (again, Division One) and Annan Athletic (scene of our triumph only a few weeks ago) followed at the weekend, though both ties in the friendly cup competition in the Borders were lost on penalties. Next up its Middlesbrough on Wednesday at SHS. Well, we should get more time on the ball (if we can nab it), but the newly-relegated English Championship side Boro are still a class outfit, so in reality it should only be a matter of how many they beat us by. Sadly I can't make the game, but I have been able to help out by producing a souvenir leaflet in lieu of a proper programme, with the agreement and involvement of Sons View editor Graeme Robertson. This will be made available in exchange for a donation to the Gordon Lennon Memorial Fund - which will help his dependents, and which has been going very well. The fans of the Clubs we've played close season, as well as our own, have been superb. Middlesbrough, too, have been incredibly thoughtful - not least Mike McGearty, editor of the official club website at the Riverside. Football people really cheer you up, sometimes.